Usually we gather together with the family at someone's place and we all either chip in to help with food and styling or one or two people get lumbered with most of the chores. Either way it is a fabulous time for people to celebrate with family and friends and it really does bring people together. Occassionally however it might be nice to consider either all meeting up at an outside venue for lunch, go on a cruise or even just make catering more simple at home. With this in mind I have provided a Northside & Southside Lunch location idea to fit both sides of Brisbane and also the lovely option of a 'River Cruise' on the Brisbane River - a really fabulous idea with everything all laid out for you. Additionally some ideas for simple catering and using help from the 'outside' to bring in and make the day a little less busier for the hosts of the day. I have been to all places listed, not necessarily for the big day but at other times dining out with friends and have chosen them for they each have something nice to offer. 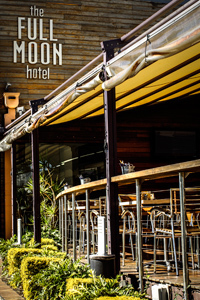 1: North of Brisbane - Full Moon Hotel, Shorncliffe. This place has become one of my favourites. Not only because the food is consistently good, but the location is fabulous. Sitting high up in Shorncliffe, overlooking Bramble Bay, the sea breezes are welcome. This hotel has large outdoor deck seating that can be enclosed with blinds as well as indoor seating. 119 (Adults) A hot and cold food buffet with several tasty selections and including desert. Christmas lunch promotional leaflet can be viewed here. Check in at the Full Moon Website for bookings, more information and children's prices. 2: South of Brisbane - The Grand View Hotel, Cleveland. This is Queensland Oldest Licensed Hotel and has history attached to it. It spreads itself over an amazing mass of lawn at the back of the hotel, a pleasant place to sit with a gentle breeze blowing. $120 (Adults). A traditional Christmas Buffet Luncheon, with the inclusion of Bonbons, Lollies, presents for children and a visit by Santa, Live Entertainment with Clare Hansson. Book and arrive from 11am. Price includes a glass of champers. Check in at the Grand View Hotel Website for all the information. $160 (Adults), Full Buffet and River Cruising. A really nice way to spend the day, just relaxing on the water. Departures are from Eagle Street Pier. 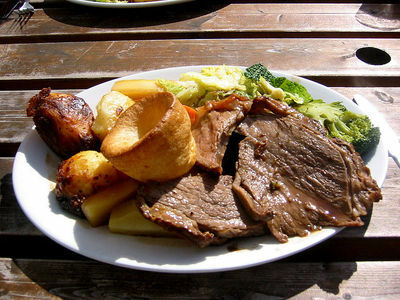 More details can be found on my weekendnotes article Christmas Lunch Cruise. Alternatively visit the Kookaburra River Queens site here. The plus ideas are just to help out the Christmas Hosts and to make their day easier. This can be as simple as arranging some Deli style platters from supermarkets. As a guide here are some information on selections from Woolworths or Coles Deli Platters. Alternatively you could source in some catering (even for part of your food) from any local provider you can find in your area. There are some boutique food providers around and one example northside of Brisbane is Vanilla Pod Cafe. One other example for the more substantial type of meal (catered for) is Gillians Cafe over in West End. They have a special Christmas Catering Service.